Become more assertive, speak your mind and ask for what you want with confidence using this powerful subliminal album. Are you tired of being walked all over? Do you struggle to stand up for yourself? Do you find it difficult to voice your opinion? If you wish you could become more assertive, get more respect and get what you really want out of life then you are in the right place - with help from our subliminal messages this really is possible! This subliminal album has been created to target your inner mind and eliminate the thought processes and beliefs which dictate how assertive you are. Some people seem to be just naturally assertive. They speak their mind, they stand up for themselves, they ask things of other people and they often have an easier ride through life because of it. The good news is that assertiveness is not something you are either born with or without - it is a skill, and you can acquire it. 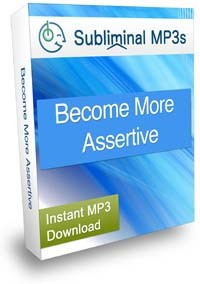 You too can become more assertive! The only difference between you and these "naturally assertive" people is in your mindset and belief systems. If you can change your mindset, change how you see yourself, and how you think about life, about what you deserve and about what you will and won't tolerate, then you will be able to change and become much more assertive. You won't be scared to assert your opinion. You will tell people what you think and feel, and you will stop worrying about what people will think if you tell how you really feel about something. You will start just being yourself and talking and voicing your feelings without over analyzing and worrying. You will feel comfortable asking for things you are entitled to. You will start to naturally see it as your natural right to ask for the things you want in life. Because of this you will get them - you can't get what you don't ask for. This album will help you to stop disappointing yourself and start getting what you want out of life! You will stand up for yourself when something compromises your morals. You won't just sit back and take it, you will stand your ground, share how you feel and take action to stop people from walking all over you. Naturally you will turn into the sort of person who just doesn't ever get walked over or mistreated. Lose those awkward feelings you associate to being assertive. Acting assertively won't seem awkward to you, it will become natural to voice your thoughts and opinions and ask for the things you want in life. Successful people are assertive, they ask for what they want, and they expect to be treated with respect and get the things they want - being assertive comes hand in hand with success, you will start to internalize this and start to live it. Ultimately you will become a naturally assertive, outgoing, and confident person in all areas of your life. This unique subliminal become more assertive mp3 will stimulate changes deep within your subconscious mind which will gradually become part of your reality, changes that will stay with you, so that you can become more assertive for life! Download this subliminal today and take the first assertive steps towards a new you, a new future, and a new more confident, assertive and successful life!